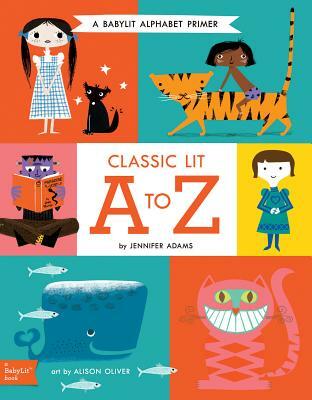 The tiniest of scholars will enjoy learning their ABCs with a literary twist by reading Classic Lit A to Z: A BabyLit(R) Alphabet Primer. Each letter of the alphabet is presented to toddlers with engaging art and a famous character, place, or concept from a beloved classic work of literature. Jennifer Adams and Alison Oliver introduce babies to letters in this board book with help from Austen, Tolstoy, Dickens, Shakespeare, and other literary greats. Allison Oliver runs Sugar design studio. Alison's design portfolio includes everything from logos to packaging and product design for clients such as Chronicle Books, Citibabes, and Aerie. She lives in New York.